Readers can find it at Barnes & Noble, Kroger, HEB, Costco and Rice epicurean Market. In addition to being distributed to popular locations throughout Houston and surrounding areas. 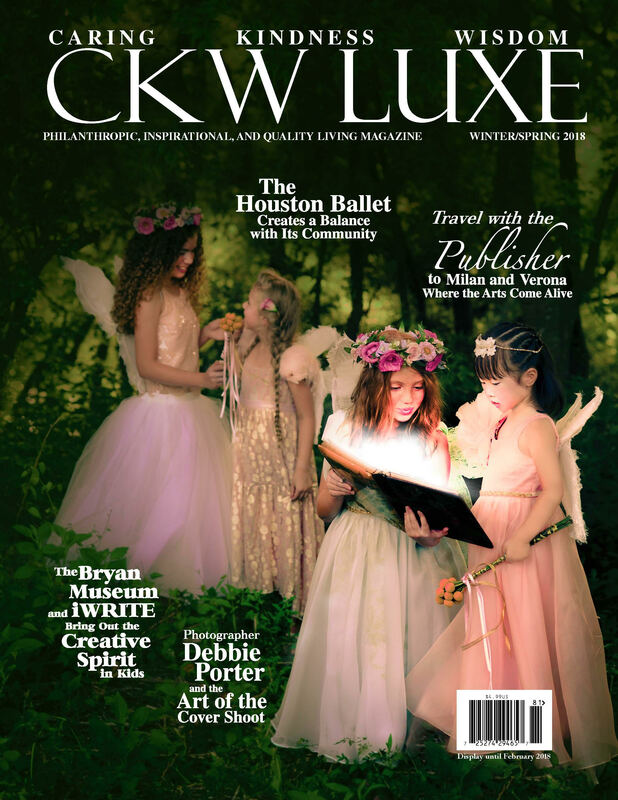 CKW LUXE MAGAZINE – 2018 Winter/Spring Edition features the Houston Ballet, The Bryan Museum’s iWRITE creative spirit for children campaign, Cover shoot and photography by Debbie Porter, with art director Cindi Rose and MORE. CKW Luxe is a Philanthropic, Inspirational and Quality Living Magazine. Profits from CKW LUXE are donated to Various Children’s Charities. CKW LUXE, KINDNESS/ CARING/ WISDOM, MAGAZINE. Bookmark.